​Pinnacle Studio Video Editing software is used by over 13 Million people. Enjoy a faster way to capture, edit and share your video. Create movies that make an impression with this sophisticated video editor. Work faster thanks to a redesigned, simplified interface and now take advantage of new Selective Color. Plus, choose Pinnacle Studio 21.5 Ultimate for new Seamless Transitions. Learn more! 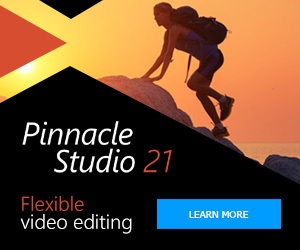 ​Pinnacle Studio 21.5 | Powerful Video Editing Software: Professional-quality video editing software with Stop Motion Animation, multi-camera editing, multi-track editing, 1,500+ effects and easy audio tools. Create movies that make an impression with this sophisticated video editor. Work faster thanks to a redesigned, simplified interface and now take advantage of new Selective Color. Plus, choose Pinnacle Studio 21.5 Ultimate for new Seamless Transitions. Learn more! 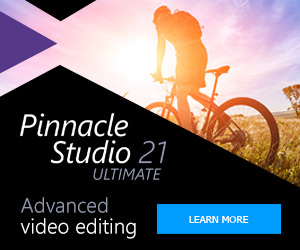 ​Pinnacle Studio 21.5 | Powerful Video Editing Software: Create movies that make an impression with this sophisticated video editor. Work faster thanks to a redesigned, simplified interface and now take advantage of new Selective Color. Plus, choose Pinnacle Studio 21.5 Ultimate for new Seamless Transitions. Pinnacle Studio 21.5 Ultimate - Video editing and Live Screen Capture: 2,000+ effects plus NewBlue premium effects. Unlimited-track, HD, 3D and 4K video editing. New User interface. New Seamless transitions. New Selective Color. New Morph transitions. New Paint effects. New Split Screen video. New Effects from NewBlue FX. New Wide angle lens correction. Learn more! New! Pinnacle Studio 21 - Get it today! Pinnacle Studio 21 Link to Buy!